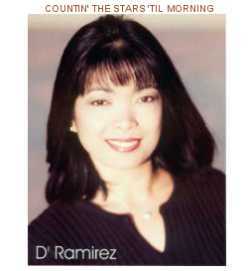 D' Ramirez, "The Asian Gone Country" was born and bred in the Philippines and had a very good career in show-biz going for her but her love of the US and Country Music persuaded her to give up a sure thing, follow her heart and realize her dreams. So far she's accomplished a lot in the comparatively short time she's lived in the US. She became a US citizen to fulfill dream #1; she fell in love with and married Jim Callicott, who is now her manager, fulfilling dream #2. What's next? She's currently working on accomplishing dream #3.... her career in country music. 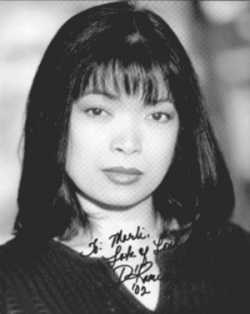 I had the honor of meeting D' and hearing her sing live before I ever listened to her four-song demo CD, "Countin' The Stars 'Til Morning". She performed at a Child Alert Foundation benefit at the Broken Spoke in Nashville, TN (benefit produced by James Bailey) and I was simply bowled over by the big beautiful voice coming out of this little porcelain figurine of a gal. She made instant friends with my Ma and my Aunt Louise and spent a great deal of "off stage" time with them, which I appreciated as I didn't have time to see or talk to anyone for any length of time. She certainly won their hearts that day and they, too, were engulfed by her vocal talents once she took the stage... and believe me, they're pretty tough critics! Enough about all of that... you're here to hear D' and believe me, while the songs on this demo CD are good, the sound and quality of it doesn't compare to hearing the D' in person. She lights up a room with her smile and takes your breath with her voice once she's in the spot light... and in the spot light is where the "Asian Gone Country" belongs. D's strong points are many, but I have to say that she can capture your heart in a heartbeat with her ballads. "How Do I Get Over You" is just such a ballad, written by one of my long lost friends, Jim Clark. 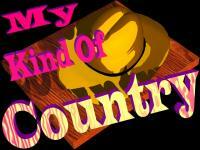 Jim has a real talent at songwriting and was managed by another friend of mine, Wendell Fowler (Morehits Music Pub.) who also has also worked with Jim Callicott in managing D's career. With such devoted and talented men of country music behind D's career, she's off to a wonderful start. I'm ashamed to say that I had D's album almost 2 years before getting down the list far enough to review her album. I can honestly say, when D' has another CD come out, I won't hesitate to hear it right away. All four songs on this introductory CD are befitting D's talent and style. Let's hope that dream #3 comes true and then we'll be "Countin' the Stars" and find that D' is a shining constellation among them. Visit D's Website for more information and Two New Songs!